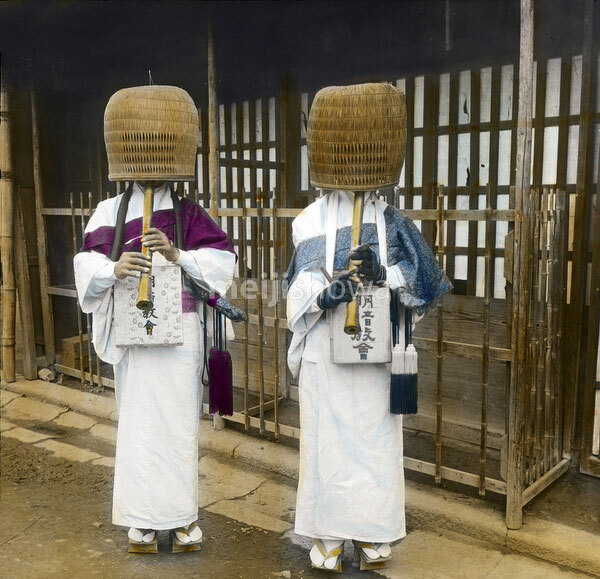 Komuso (虚無僧), monks of the Fuke school of Zen Buddhism (普化禪), playing their shakuhachi flutes for alms and meditation. Komuso wandered the streets and byways of Japan, wearing fukaamigasa (深編笠), sedge hats that completely covered their face. This was believed to remove their ego. The outfit became a convenient way for spies and criminals to hide themselves in broad daylight. As a result, the practice was repeatedly banned. Photographed in 1904 (Meiji 37).